Coach soccer the right way with this great U9 drill! Coach soccer the right way with this great U9 drill called color passing. Some coaches like to use this as a warm up drill, others use it to help players with their passing. Take a look at the below diagram. You will need to mark out an area big enough for the amount of players you have but don't make it too big. You will need half of your players in one color and half of your players in another color. You will also need approximately one ball between 3 to 4 players. This is a drill well suited to allow your players to practice their passing, their touch and dribbling and also their understanding for spacial awareness. The idea of the game is for the player who has the ball to pass to another player of a different colored shirt (so red can only pass to yellow and vice versa). This game should help with keeping the heads up when in possession of the ball to look for the right player. The players should move around the area and those without the ball should be looking to get into space to retrieve the pass. Make sure the players are NOT running around in circles or are bunched together. It can be difficult sometimes to coach soccer to eight year olds but make sure the players dribble and pass the ball correctly and are always in space. You could begin by just having your players stationery (not dribbling) and passing the ball to the opposite colored shirt and then progress in to dribbling too. Also, when the coach shouts 'change' the players have to pass to the same colored shirts as themselves this time. Once the coach shouts 'change' again then they once again pass to opposite colored shirt. You could also make it so each player has to pass to everyone in a minute for example. Another great progression here is for players to pass the ball in to space for the other player to run on to rather than straight at them. You could also introduce a 1-2 pass where the same color shirt has possession of the ball the whole time until changed. 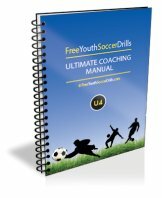 Need to coach soccer to different age groups? Click Here!